Cantilena depends on help, whether it's in the form of financial assistance or volunteers distributing posters and providing accommodation during the Festival. The help you give us means that we can continue to bring the pleasure of great music to the people of a wonderful island where such music is rarely heard, and to give a unique opportunity to young music students who benefit greatly from the experience of playing and rehearsing away from their academic pressures. Cantilena needs funding beyond ticket sales to be able to take our music to Islay. In particular, however, we always give the opportunity to at least five selected students from the Royal Conservatoire of Scotland to perform beside our professional players, giving them a unique experience of learning and performing to the highest standards – an experience which is both invaluable to their careers and hard to find elsewhere. The students do not receive any fee, but Cantilena pays for their travel to Islay, accommodation, meals, and of course the personal tuition and direction from our professional players. To help us take these talented students to Islay, we are offering the opportunity for those wishing to support our work to become a Cantilena Patron, by donating either annual payments of £100 or £250 or monthly payments of £10 or £20. Other amounts may be specified if you wish. Eligible UK taxpayers can also GiftAid, meaning that a donation of £100 is worth £125 to Cantilena. Or speak to us during the Festival. We take world-class chamber music to a place it is not normally available. We also give talented young musicians the chance to perform with us to our high standards, learning from some of the most experienced professional orchestral players in Britain. For 2015 and onwards, we are looking at ways of reaching further into the communities on Islay by arranging smaller performances in places like village halls and community centres. 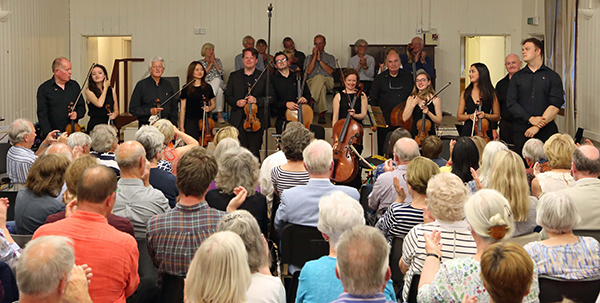 Our Artistic Directors have already visited some venues - we are pleased to announce that we will be hosting an evening of light classical music in Portnahaven Hall on Friday 3rd July. Taking such an ensemble to a remote part of the country, however, is expensive, and Cantilena is deeply indebted to our funders who help to make it all happen. If you would like to join our list of funders, please contact us. Like many arts organisations, our outgoings cannot be met by ticket sales alone, and we need your support to be able to continue our unique Festival. If you are interested in helping to fund Cantilena or would like more information, please contact .